Republican candidate goes on record, hampered by past calls to cut defense aid to Jewish state he has recently tried to distance from. Kentucky Senator Rand Paul officially announced his presidential campaign on Tuesday, becoming the second Republican candidate to do so ahead of the 2016 elections after Senator Ted Cruz (R-TX) became the first late last month. "I am running for president to return our country to the principles of liberty and limited government," Paul announced on his new website. Other Republican candidates expected to be in the race include Jeb Bush, Marco Rubio, Chris Christie, Scott Walker and Lindsey Graham, with none pulling significantly away from the pack in polls yet, reports CNN. 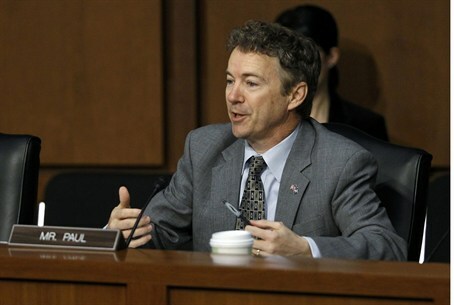 Paul, who entered the Senate in 2010 backed by large Tea Party movement support, has been defined as an advocate of "mainstream libertarianism," focused on civil liberties and opposed to foreign intervention by the US. The senator has also vocally opposed America's annual defense aid to Israel which totals roughly $3 billion a year, and in a January 2013 visit to Jerusalem he called for the US to start cutting aid to Israel. Paul later that same month tried to distance somewhat from the statement, voicing his backing of the Jewish state by saying "an attack on Israel will be treated as an attack on the United States." Paul's push against Israeli aid was given more credence as a sign of antagonism by the fact that his father, Ron Paul, who was a Texas congressman and thrice failed in presidential bids, similarly called to cut defense aid to Israel. Apparently aware that his position against support for Israel was likely to rankle with Republican voters, Paul in January launched a bill to cut funding to the Palestinian Authority (PA) until it dropped its request to join the International Criminal Court (ICC), a bill he touted in a video last month. Paul's vocal support of Israel did not convince the National Jewish Democratic Council, whose chair Greg Rosenbaum responded on Tuesday to the campaign announcement by saying, "Senator Paul has stated that he wants to be a ‘different kind of Republican.’ Based on his history, we can only imagine what that kind of Republican will be (sic)." "Undoubtedly, it will be a Republican who would cut foreign aid to our allies throughout the world, including Israel, which would be dangerous for their safety and security," said Rosenbaum. "This kind of Republican calls aid to our stalwart ally ‘welfare,’ a stance that has drawn criticism from members of his own party, and he has only recently flip-flopped on the issue."